WINNIPEG — Semyon Varlamov was relieved to finally leave the ice with a good taste in his mouth. 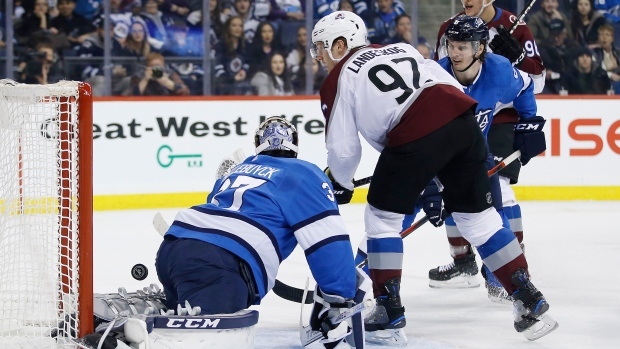 The Colorado goalie made 24 saves and captain Gabriel Landeskog scored his team-leading 30th goal of the season as the Avalanche ended their season-high eight-game losing streak with a 4-1 victory over the Winnipeg Jets on Thursday. "The stats aren't great, we're losing a lot of games and stuff. We needed this one so bad." Dominic Toninato recorded his first NHL goal, while J.T. Compher and Sven Andrighetto also scored for the Avalanche (23-23-11). Matt Nieto had a pair of assists. Brandon Tanev scored his career-high 12th goal of the season for Winnipeg, which lost for the first time in regulation in their last 10 home games (8-1-1). "They were a desperate team," Winnipeg captain Blake Wheeler said. "It's been going tough for them. There was a certain amount of desperation in their game. We weren't able to match it often enough." Connor Hellebuyck made 31 saves for the Jets (36-19-3). "I thought their whole team was good," Winnipeg defenceman Tyler Myers said. "They were the better team, they deserved the two points." Colorado outshot Winnipeg 13-8 in the first period and led 2-1 at the intermission. Toninato started it off by swooping in and sending a rebound into the net at 5:21 in his 38th career game. "It felt great getting the first one out of the way and I can just concentrate on playing my game," Toninato said. "But most importantly, we got the win. "We've been struggling for that, so it was nice to get the win and hopefully we can get rolling now." Landeskog made it 2-0 with a high backhand shot past Hellebuyck at 10:29, but Tanev responded 24 seconds later by firing a sharp-angled shot that hit a stick and went by Varlamov. "I don't think we played our best game," Tanev said. "We didn't get as many pucks to the net as we wanted in traffic and making it difficult for him to see those. But I think we can learn from this and we look forward to playing the next one." Compher's short-handed breakaway goal at 6:12 of the second gave the Avalanche a 3-1 lead that held through the period. Colorado stretched its shots-on-goal advantage to 25-17. Winnipeg had its second power play of the game early in the third period but Varlamov stopped two shots, including a backhand by Patrik Laine, who was back on the Jets' first power-play unit. The teams traded some power-play time late in the third, but it was Andrighetto with an even-strength goal at 16:21 that sealed Colorado's victory. The Avs were 0-5-3 in their losing skid. "It's not just the win, it's the way our team played," Colorado head coach Jared Bednar said. "Fantastic team effort, real strong commitment to check. All the details of our game and the whole lineup. No passengers." Winnipeg ends a three-game homestand Saturday against Ottawa. Colorado returns home to host St. Louis on Saturday.